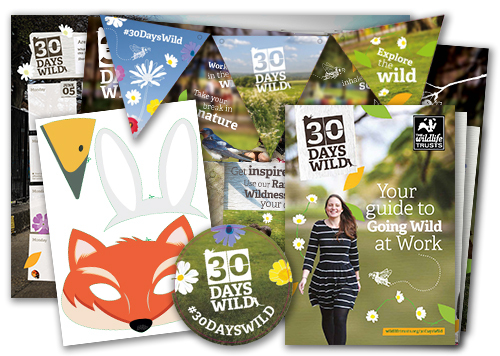 This June, join hundreds of thousands of people taking part in 30 Days Wild. We're challenging you to do something a little bit wild every day: that's 30 Days of fun, exciting and simple Random Acts of Wildness. It's easy! Want to know what other people are up to? Find us on Facebook, follow us on Twitter or join in the chat with the 30 Days Wild Facebook group. help you go wild, a set of super stickers, and some wildflower seeds to brighten up your garden or window box. It's not just wildlife that 30 Days Wild helps; you'll feel the benefits, too. We're all a part of nature, and nature needs to be a part of our lives. Over the past four years, we've been working with the University of Derby to find out about the impact that 30 Days Wild has on people taking part. Spending time outdoors can make you feel happier, healthier and closer to nature, as well as helping people to take more actions to help wildlife. action for wildlife. We believe that everyone can make a positive difference to their local environment and that by working together we can achieve nature’s recovery on land and at sea.